"Thank you PiSL for coming to help us when no one else was here after the earthquake, not the Nepali government or any nonprofit organization. Our new earthquake resistant preschool classroom is so beautiful and it will serve many children for many years to come." The 2015 earthquake in Nepal was a devastating blow to a country already in dire need. Thousands of lives were lost. Hundreds of thousands of homes were destroyed in addition to thousands of school buildings. Four early childhood classrooms were damaged beyond repair. PiSL and VIN, our partner Nepali nonprofit organization, immediately helped to construct temporary learning centers of bamboo and tin roofing. These served the need for shelter, but over several year they became leaky with holes in the walls and dirt floors. The children and teachers deserved more. The cost to build a government approved earthquake resistant classroom is about $12,000. Transportation of construction materials can be very challenging due to the very poor roads or no roads at all to some schools. 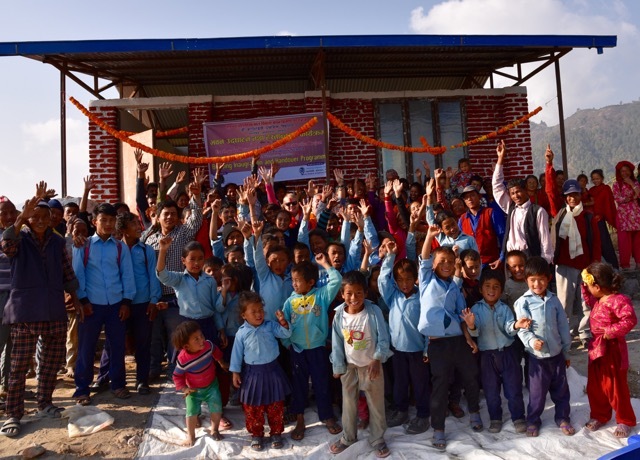 Construction on a new earthquake resistant classroom was recently completed in the Okharpauwa region, an area that was heavily affected by the earthquake. This Nepali designed structure utilizes a steel framework with brick walls using cement mortar and steel reinforced banding. The community members were an integral part of planning and construction. Men and women, grandmas and grandpas all worked side by side to dig the foundation. This beautiful new building will be used as a preschool classroom from 10 to 2 pm, 6 days a week and as a meeting room at other times. This classroom is the only free-standing, structurally-sound building in miles. The community is very proud of their new classroom! 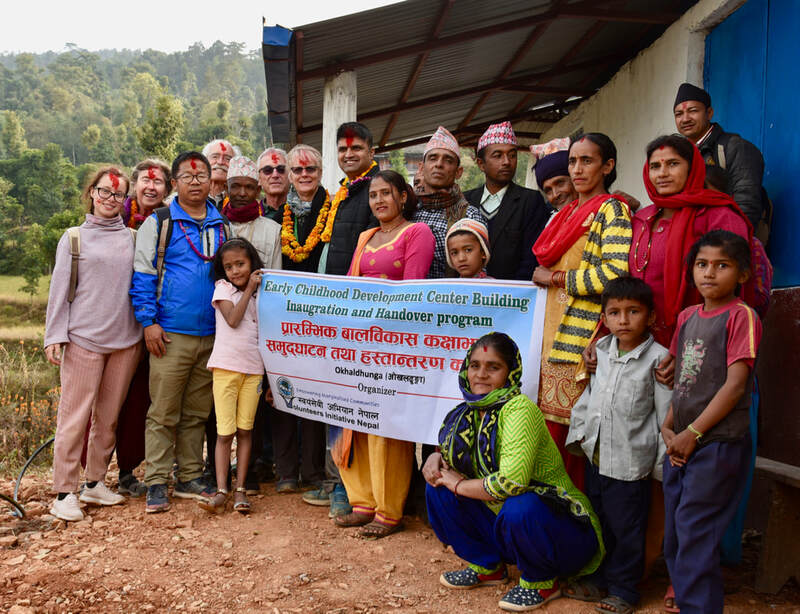 We are happy to report that three additional classrooms in separate villages that needed to be rebuilt in the Okhaldhunga region are finished! One school had a temporary learning center made of bamboo, but it was washed away in a big monsoon rainstorm. Another school lost all their all their school buildings in the earthquake and were holding classes in a rudimentary bamboo structure. The third ECD was currently in a room that was deemed unsafe by the government. Building these classrooms was a challenge as each of these villages are quite remote and required strong trucks to transport the building materials. The buildings were built using local stone Bricks were impossible to transport. A steel structure was integrated into the earthquake proof design. In November all three classrooms were complete and we attended ceremonies in each villages. It was a proud moment for PiSL, VIN and all the community members. Although was have enjoyed helping these communities get these wonderful new classrooms, these will be the last ones that we will support. For our small nonprofit, the cost is really prohibitive and the logistics are so challenging. We are proud that we kept our commitment after the earthquake happened to give these four communities a beautiful new preschool!